How Should We Respond to Reports that a Fragment of Mark Dates to the First Century? An Egyptian mask made from papyri and linen. Brooklyn Museum, Charles Edwin Wilbour Fund, Creative Commons. 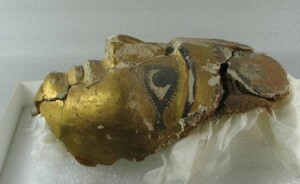 It was reported yesterday that a three-dozen member team of scientists and scholars—apparently including the well-respected New Testament historian Craig Evans—is working on a papyrus fragment of the Gospel of Mark, discovered as part of an ancient Egyptian funeral mask. 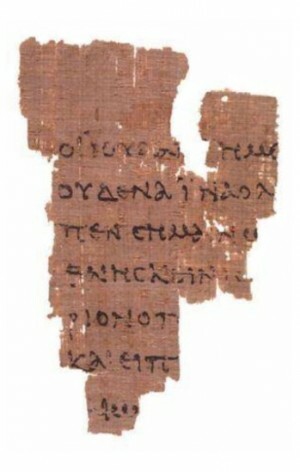 The Gospel of Mark fragment under discussion here seems to be the same one that Daniel B. Wallace surprisingly referenced in his February 2012 debate with Bart Ehrman. Some caution is in order, however. As Peter Williams points out, 1-2 will not help researchers reach a date as precise as AD 80 or 90. That leaves 3-4. If for convenience we suppose that  other manuscripts in the mask are ones with dates that survive (remembering that for a majority of texts no date survives) and  that the mask luckily enough contains four texts with firm date formulae (which would be really nice, but quite unlikely) and that these date formulae show manuscripts from the years 50, 60, 70 and 80, [then] that would still not mean that they could not be put together with a manuscript from considerably later than the year 90 to make a mummy mask. The double negative in the last clause is a little confusing. Williams means that even if conditions were ideal, it still wouldn’t preclude the fragment itself from being later than the other fragments surrounding it. The other possibility, of course, is that somehow the archaeological context itself would date the mummy mask to a specific decade, though this would be unusual. How should we respond to something like this? I think it’s appropriate to be hopeful. As an evangelical, I believe the best historical evidence points to the New Testament gospels composed in the first century: Mark (mid- to late 50s), Matthew (50s or 60s), Luke (c. 58-60), John (mid- or late 80s or early 90s). If this discovery doesn’t pan out, it doesn’t affect our dating of the gospels because the dating of the autographs (the originals) is not dependent upon the dating of manuscripts (the copies). If it does pan out—especially if it can be dated with confidence to the 80s—it would be a major discovery, because the oldest of anything is always noteworthy. As Christians, we should take a “wait and see” approach. It’s tempting to be either naïve (of course this is true!) or cynical (of course this isn’t true!). One of the unfortunate things about announcing a discovery apart from a published peer-reviewed process is that the church and the culture simply have to take the scholars’ word for it. Amateur sensationalistic archaeology (which this does not appear to be) follows a predictable script that almost never involves peer-review publication first. So I think the cause of truth—whatever that may be in these cases—is best served when there is rigorous scholar vetting before popular announcements and debates. Let’s think critically and wait to see the published results. Until then, debating the details won’t get us very far.